Hi, we purchased a MISUMI single axis high precision stage, but then needed to modify the setup for space constraints. We had to mount the motor next to the stage instead of directly inline with it and then added a custom bracket and belt drive. A picture of our modification is attached for your review. The problem with the new arrangement is that the table moves in the opposite direction because the motor is mounted backwards. This is causing some confusion with our operators, is there any way to fix this? Thanks. Brad, thanks for your question about our high precision stages and for sharing your design modification with us! We are always interested in seeing what new and innovative ideas our customers have come up with using MISUMI products. 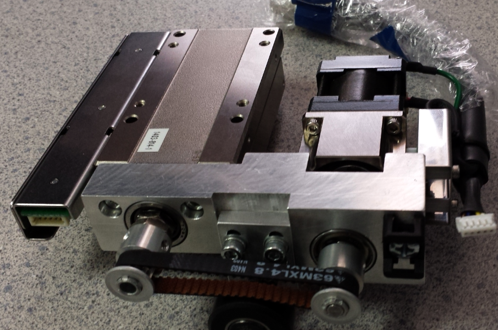 For those not familiar with MISUMI high precision stages, below is a picture of an unmodified single axis stage with the stepper motor attached. For Brad’s application, they couldn’t have the stepper motor in that location and had to position it to the side of the stage. They then connected the motor to the stage using a timing belt and pulley system. As he mentioned, this works fine, but the new design will move the stage in the opposite direction of the original control, causing confusion for the operator. If you’re not familiar with the controls available for high precision stages, check out this product page. Fortunately, there is an easy solution to the problem. Taking a look at the five phase stepper motor wiring diagram above, the original firing sequence for the contacts is A-B-C-D-E, with each phase giving 0.72 degrees of rotation. We need the motor to turn in the opposite direction, so the new sequence is A-E-D-C-B. This can be accomplished by changing the colored wires on the stepper motor to match the chart below. After adjusting your wiring, the high precision stage will move in the expected direction when using the original control setup. For any other questions regarding high precision stages or stepper motors, the MISUMI Engineering Team is always ready to help and available at engineering@misumiusa.com. MISUMI USA is the industry leader in supporting mechanical components for factory automation, press die and plastic mold components, cutting tools and gauges. Our goal is to use this blog to share useful industry information and empower engineers in the Automation, Press and Mold Industries. How To Spend Your Holiday Money: 5 Great Gadgets to Give Yourself this Year!